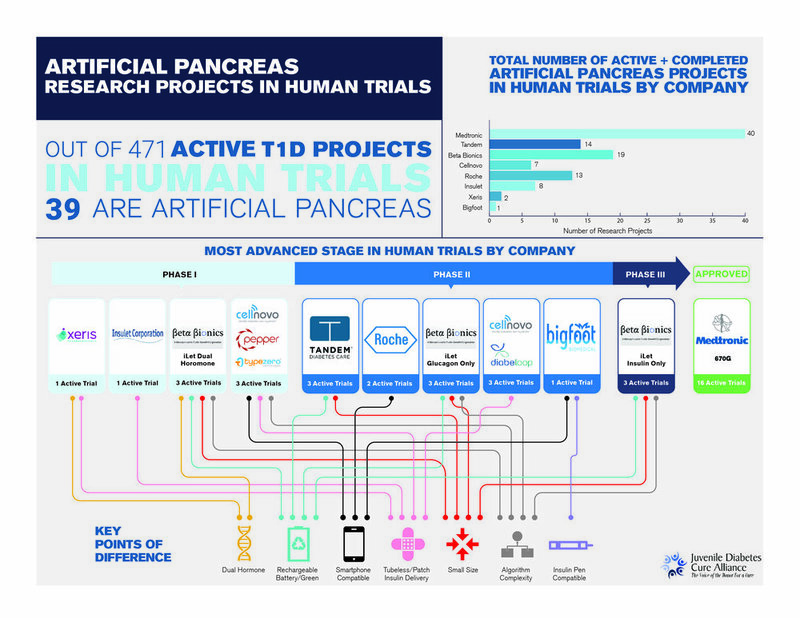 This infographic provides an overview of Artificial Pancreas (AP) competitors and device solutions by stage in human trials. The Artifical Pancreas is designed to mimic the function of a normal pancreas by automatically delivering insulin in response to changes in blood sugar to prevent hyperglycemia and hypoglycemia based on an algorithm’s analysis of a sensor glucose reading. It is a combination of four basic parts: a controller, algorithm, continuous glucose monitor, and insulin pump and has the potential to significantly ease the burden of those living with T1D. Nine APs Being Tested: There are nine Artificial Pancreas (AP) device solutions currently testing in human trials. Development is 100 Percent Commerical: All current AP combinations are being developed by commercial entities, although JDRF continues to fund six of the nine active projects. Medtronic Leads the Field: They have the only approved closed loop AP approved for market and have more active and completed projects in human trials than any other competitor. Almost All APs are Made by Multiple Companies: All device solutions, except for Medtronic, are combinations of various technologies and algorithms. In addition, Dexcom CGM is used in six out of the nine AP device solutions. No current AP in development is a Practical Cure: In a 2017 survey, the JDCA asked members of the T1D community what they felt an AP device must do in order to be considered a Practical Cure. The responses highlighted a few key design capabilities. First, the device must be small enough that the wearer can forget they have it on. Second, it must also eliminate the need for mealtime boluses, calibrations, carb ratio inputs, etc.